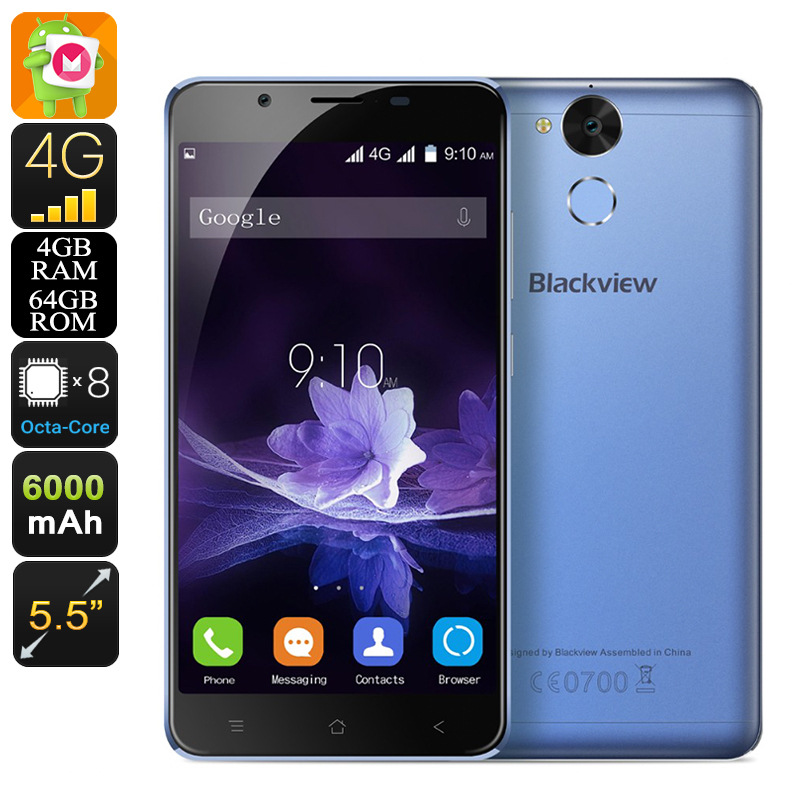 Successfully Added HK Warehouse Blackview P2 Smartphone - Dual SIM, 5.5-Inch FHD Display, Octa Core CPU, 4GB RAM, 6000mAh, 4G (Blue) to your Shopping Cart. The Blackview P2 is the latest Android phone launched by the trusted Chinese smartphone manufacturer Blackview. Featuring an ultra-sleek design and thin bezels, this Android smartphone allows you to take the most out of its stunning 5.5-Inch full-HD display while simultaneously keeping a compact design. Running on an Android 6.0 operating system you can be assured that this Chinese smartphone delivers a smooth and powerful performance – allowing you to enjoy the latest features the mobile industry has to offer without experiencing any lag. Along with its FHD display, you will be able to watch your favorite movies, play the latest games, and experience the newest mobile applications in stunning detail and vivid color – ensuring that no matter where you use this Android phone for, you will always be treated with breathtaking visuals. Featuring two SIM card slots and supporting Dual-IMEI numbers, the Blackview P2 is an Android phone that allows you to efficiently separate your work and private life in just one device. Being able to be reachable on two different phone numbers simultaneously and to be connected to two different 4G network providers will truly enhance your overall connectivity – ensuring that you’ll always stay connected no matter where on the globe you’re located. Additionally, its 4G support also assures that you’ll always be able to enjoy the fastest mobile data speeds out there, letting you download files, stream online media, and browse the web at lightning speeds. With its 6000mAh battery that delivers a stunning 10 hours of continuous usage time, you can be assured that the Blackview P2 takes you through the most demanding of days without needing to worry about battery life. Packing a powerful Octa-Core CPU that has been clocked at 1.5GHz; you can be assured that this dual-SIM smartphone handles the latest and most demanding of mobile applications and games at ease. Added to that, the Blackview P2 also features a stunning 4GB of RAM – allowing you to engage in excessive multitasking sessions without needing to worry about slowing down your device. With its 64GB or internal storage and 32GB supported Micro-SD card slots, this Android phone offers plenty of storage space that can be filled up with your favorite media, files, and games alike. Increasing your overall user experience even further, the Blackview P2 supports OTG – allowing you to connect external hardware devices such as a memory stick, keyboard, or game controller to your Android device. At the rear of this sleek Android phone, you will be able to find a beautiful 13MP camera that snaps breathtaking images and stunning 4K video. Whether you spent a simple night out with your friends, attend a family gathering, or enjoy a beautiful view during your upcoming holiday – with this professional-grade camera in your pocket you can be assured that not a single special moment in life passes by uncaptured. Besides its amazing camera, you will also be able to find an ultra-fast fingerprint scanner on the rear of this Android phone. Featuring the latest technology, this state of the art fingerprint scanner lets you unlock your device in a split second and additionally assures that all your personal files are well secured against any unwanted visitors. 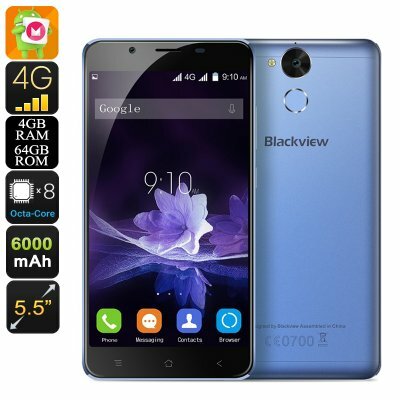 The Blackview P2 comes with a 12 months warranty, brought to you by the leader in electronic devices as well as wholesale electronic gadgets..